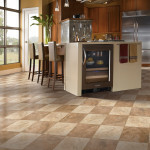 Through the flooring innovations of today, ceramic tile is not only more affordable, but is also easier to maintain. The options for color, patterns, sizes, shapes and design are infinite. We are sure that with the many different stones we have available, you will be able to find just the right stone for your home and design needs. Before looking at stone, there are a few things you should be educated on. The first thing is that there are four distinct types of stone. These include Ceramic, Porcelain, Marble and Granite. 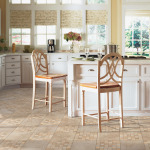 Within the Ceramic selections, there is glazed tile and unglazed floor tile (aka Natural Stone). Glazed is the most common and it has a special coating that is applied to the body of the tile and then fired at a very hot temperature to seal the tile. The glazing then creates a hard and non-porous result. The benefits of glazed stone include Stain Resistance, Scratch Resistant, Fire Resistant, Fade Resistant, Slip Resistant and the best feature, Ease of Cleaning! 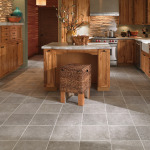 The unglazed floor tile (aka Natural Stone) is free of the glazing process. However, while unglazed tile can be incredibly beautiful, it is porous and needs to be maintained regularly. There is a special sealant that can be applied to prevent stains and the seepage of spills and general dirt into the pours of the stone. 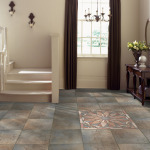 Porcelain Tile is a type of Ceramic that is made of very fine mixture of clays and minerals. The molecular makeup is similar to fine china or high end dinnerware. These clays allow porcelain tile to be fired at even hotter temperatures than the ceramic tiles, typically near 2400 degrees (F). 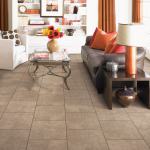 The higher the temperature, the denser the tile will become and the less moisture it will attract. The benefits of Porcelain are similar to those of ceramic, they are denser and harder than most other tiles, they are highly stain and moisture resistant, they are naturally hygienic with an easy to clean surface. Lastly, porcelain is not only beautiful but equally durable and it can be used in both residential and commercial scenarios.